How many times have you been told to let God plan your life and immediately had a mini panic attack? How many times has someone said to you "May the will of God be done regarding your plans" and you struggled to say "Amen". How many times did you say "Amen" then went quickly to a quiet corner to prayerfully enforce and establish your plans? How often have you hesitated in saying the words "May your will be done in my life God"? If any of these questions apply to you, I am here to inform you that you have divine will phobia. It is natural for most people to worry at the thought of following God's perfect will. What if God decides to take you from a palace and make you lead some grumpy and ungrateful people through the wilderness? What if God decides you should be sold into slavery and even go to jail for a crime you did not commit just for his will to come to pass in your life? What if God's will has your thrown in a den of lions and instead of shutting the mouths of the lions, they jump at you immediately and tear you apart? So many what-ifs creep into our minds when we think about the will of God, that it immediately sends us into panic mode. We start to enforce Matthew 7:7 that says we should ask and we shall be given. And later on in the chapter, Jesus said no father will give his child a stone when he asks for bread, or give him a snake in place of a fish... so we believe that by establishing our desires in prayer, we are escaping the stones and snakes God might have in store for us. That is what the Scriptures mean when they say, "No eye has seen, no ear has heard, and no mind has imagined what God has prepared for those who love him. But you see what I've come to realize is that the fear of the will of God is a fear that has been planted in our hearts by the devil. It has been supported by his lies that our plans are much better, and a sense of self-assurance that says we know best and our plans must come to pass. That is because Satan knows that God has amazing plans for our lives, and the best way to destroy those plans is to make us feel we must be in control and things must play out the way we want. Satan feeds our ego when we proudly tell people that we are in charge of our lives. It feels good to say we are living our lives by our own design, not by the design of a God we call on but cannot trust because he might just send us to the dungeon in line with His will. This was the verse I received while I prayed against the confusion and battles I faced. God's plans for us are GOOD. They are designed to give us hope and A FUTURE. If it was only hope, one might say "yeah whatever. Hope deferred makes the heart sick". 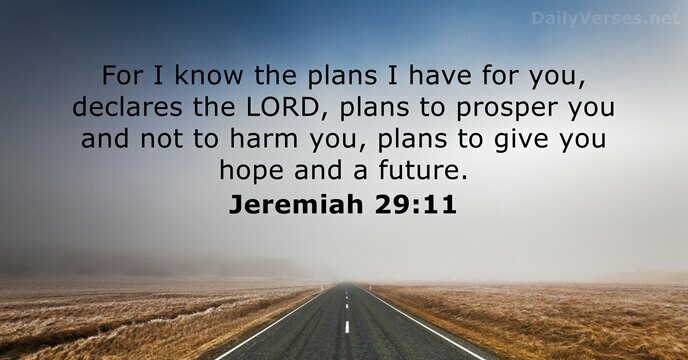 But we also have a future which highlights that our hopes in line with God's plans for us will be fulfilled. The plans of God are to PROSPER us, not to leave us in slavery or in a dungeon. He wants to prosper us and bless us! He wants us to be happy and fulfilled. But Satan wants us to believe God's will is not enough. He wants us to think if we are thrown in prison, God will never come to our rescue. He wants us to think if we are thrown in the lion's den, the lions will tear us apart. He wants us to think God will not show up. Afterall, the Israelites were in slavery for hundreds of years. Where was God? This was for me.....I'd have to repeat to myself that God's plan for my life is of good and not evil.